In talking about how we come to know things beyond their external appearance, Paul Klee believed that the artist should try to transcend the object viewed and visually open it up to reveal it’s internal being. He writes” Experiences of this kind, duly added together, permit the “I” (the artist) to deduce the interior of the object from its exterior; this it does intuitively in so far as the “I” is encouraged…to draw from the exterior conclusions of an affective nature which can intensify the impression of the phenomenon to the point of functional interiorization.” Decades later, Hans Hofmann also wrote about the role of the artist as a cipher or interpreter of natural beauty. Hofmann believed that the beauty and truth of nature is the bedrock of abstraction. Both men viewed the act of making art as a subjective statement, one that renders even the most precise work essentially abstract. Like the theory of “the limits’’ in calculus, no matter how closely one tries to approach an objective reality, the hand and the eye will always be subject to the interpretation of the mind and the heart. I have had the good fortune to know all of the artists that are gathered together in this exhibition, entitled “ Inside Abstraction” David Cummings, Chris Martin and Srule Brachman’s work I have known since the early 1970’s. Many of these artists lived in Brooklyn at different times in their lives; three do so now, though unaware of the work of the others. Each has chosen a unique approach in intuiting objects in nature and the consequent manifestation of an internalized abstraction. Sam Fryer is the youngest in the group, and his work is for me totally charming and direct. Klee would have approved of the humor that balances the formal and informal elements in his uncontrived investigative compositions. Gelah Penn calls her sculptures “Scribbles” as they evoke the spider web and other natural complexities. Her dynamic pieces direct the viewer to consider the shadows created by the sculpture as an essential part of her “drawing.” The work derives further strength from the artist’s tip of the hat in the direction of Process Art, flirting with the early work of sculptor, Alan Saret. Scooter Flaherty works in Washington, D.C. His paintings are made on a hard surface where he spends hours layering color and creating hues of extraordinary luminosity. He works in modules, each a successful painting or reality in itself. Flaherty, Brachman and Shapiro are close in their formalist approach. Srule Brachman’s series entitled “ Dancing With Ronnie” (named after his late wife and painter, Ronnie Tendler,) presents us with two organic forms that pulsate and tango against gritty fields of rich color and texture. He sets up a tense duality between what we are seeing as form and what is field. Michal Shapiro presents us with a unified field composed of microcosms. Her mosaic surfaces are collages built from painting on re-cycled Styrofoam and then cutting and piecing the work together, and painting again on the finished surface. Shapiro forges a lyricism where edge meets edge, and myriad gestures dissect the whole: the results prove that the whole can be more than the sum of its parts. David Cummings and Brice Brown share affinities for using symbols from which the abstract nature can be addressed. A superb colorist, Cummings has chosen an organic and recognizable object, the human hand, as a scaffold for the play of marks and colored intervals. Cummings takes the viewer from the reference to nature directly to an iconic abstraction. Brice Brown is a painter and a silk-screen artist who has broken ground on a variety of unconventional materials upon which he can silk-screen, from cold steel to yielding plastic. In this show Brown presents a literal Pandora’s box of brilliant and bright plastic squares that can be arranged by the viewer in many configurations. And, like Cummings, Brown repeats certain encoded images, but in his case the image derived from nature is embedded in plastic as if timelessly stuck in amber. Kim Uchiyama has the soul of a great water colorist with her bright and airy application of colored intervals, evocative of landscapes and pearly sunsets. Hers is a straightforward approach to painting stripes or bands of high intensity color, that back off in painterly grace from being purely hard edge. She builds her surfaces slowly and thoughtfully, and they should be viewed and savored in this same way. Chris Martin’s work is of a similar Zen-like quality, as if he had just sprung out of a deep reverie with brush and paint in hand to find the canvas before him, waiting to receive his dream. His strength is in an ability to create symbols and markers that bridge the inner life of the abstract artist with the active elements of nature such as rose petals and “our daily bread”. Evy Twitchell visibly struggles with nature as if her hand were literally interpreting signals from the very movement of things that grow in the earth. These “seismic” works are simultaneously strong and delicate. 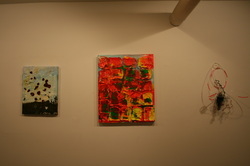 Her colors are true and she generously shares with us her delight and success in delving into the inside of abstraction. Vered Lieb has lived and worked in the Soho area of New York City for over 35 years. Besides painting and exhibiting her work, she co-founded with Robert Witz the artist magazine “Appearances” in the early 1970’s. She went on to found “ Review Artists on Art Magazine, which was the first of its kind to commission original art by such artists as Sean Scully, Richard Bosman, Thornton Willis, Stewart Hitch, Hannah Wilke, Peter Pinchbeck, Jake Berthot, Ray Parker, and many others. In the early 1970’s when “conceptual art” dominated, she became an early spokesperson for Abstract painting, especially second and third generation New York School. Despite prevailing rhetoric that “painting was dead”, Vered believed in and spoke up for the power of painting as occupying in our culture a most advanced position. In the late l970’s and 1980’s she was encouraged by then editor Joseph Masheck to contribute to Art Forum and by Richard Martin, of Arts Magazines to write reviews and essays on such artists as Joseph Glasco, Thornton Willis, Deborah Rosenthal, and Joanna Pousette Dart. Vered Lieb wrote with Barbara Rose and Diane Waldman the catalogue introduction for Ray Parker’s exhibition at the Phillips collection, and edited 20 years of letters between sculptor David Smith and painter Herman Cherry. Her recent reviews and essays have covered such up and coming artists as Ben La Rocco, and more senior painters such as James Little, Al Loving, Richard Mock, Dan Christensen, Tom Evans, Charles Hinman and others. She has curated many shows, in galleries and museums in NYC, and has taught at Pratt, Syracuse University and SUNY. Vered has work in the permanent collection of the Albright Knox Museum and in private and public collections here and abroad.